As it says in the name, Chateau de Coat-an-Noz nestles deep in the forest of Coat-an-Noz. 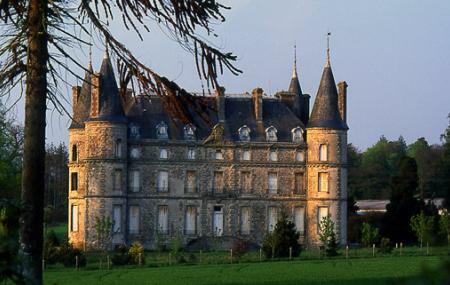 Built by the Countess of Sesmaisons between 1880 and 1884, the castle came under the ownership of the princes of Faucigny-Lucinge by alliance. It was resold by them to overcome their debts in 1923, and the King of Nickel bought it for his wife in 1929. The castle passed through many hands after the death of the king, but unfortunately, none of the owners could do justice to the grandeur of the structure. Finally, in 2011, it was bought by private owners who have managed to restore it. Personalize your visit to the city by chalking out a plan using Belle-isle-en-terre trip planner. Book perfect hotels in Belle-isle-en-terre like Hotel Restaurant La Pomme D'or, Rasidence Coatarmor, Petite Maison Bretonne and La Kerandire. Curated Belle-isle-en-terre vacation packages await! Book the best ones and start turning your dream into reality.Discover various ways for how to reach Belle-isle-en-terre and complete the booking by choosing your mode of transport. Love this? Explore the entire list of places to visit in Belle-isle-en-terre before you plan your trip. Fancy a good night's sleep after a tiring day? Check out where to stay in Belle-isle-en-terre and book an accommodation of your choice. Amazing! we viewed it several times when it was for sale with the intention of doing the same thing to it but never committed, as we had a restoration on going in Callac just a short drive down the road and still live there now.. Amazing job you have done we drive over with only the intention to stop outside and admire often. It's in my bucket list !